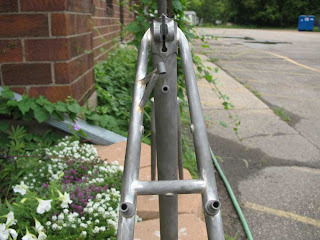 This is the first frame I’ve built with the Nuovo Richie Series lugs. I like them. 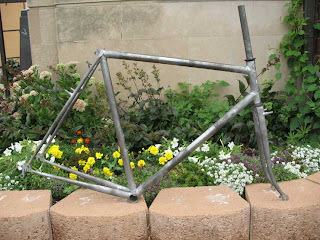 This frame is built around Paul Racer centerpull brakes. 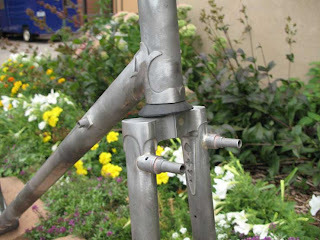 Hence the canti posts in the unusual position. The Paul brakes work great and allow for fat-ish tires and fenders. Those requirements ruled out even standard reach brakes and the customer didn’t want cantis. Racers to the rescue. 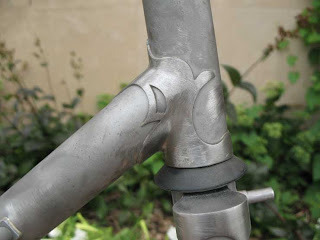 The steerer is threadless and obviously is still at the stock length. It will be shortened during assembly. The next pictures show close ups of the lugs after b razing an d clean up. They have been thinned and sanded smooth. 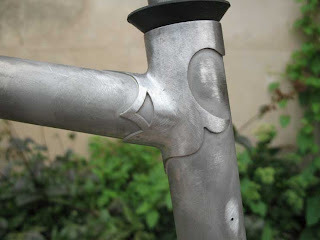 The photo of the seat lug shows the braze on for the tail light behind the seat tube. The light is an LED blinky light that I make. It’s very bright and yet it’s attractive. The light weighs 31 grams and is waterproof. Pictures of that some other time. 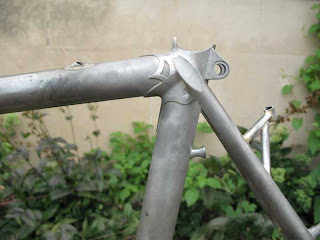 The fork will have braze ons attached to the fork blades for a custom front rack. I’m still working on the rack. Once the platform is completed then I will know where to put the mounts. In addition to the fork blades this rack will mount to the front of the Paul Racer brakes. The rack will secure the front of the fender, hold the headlight and on occasion a handlebar bag.